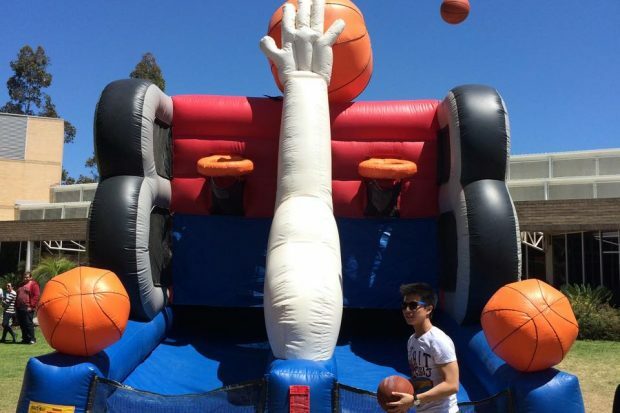 Inflatable Basketball Shootout should be called Basketball Shootout with a Twist. This game is fast, furious, and fun. It’s great for corporate events, staff Christmas parties, fetes, fairs and birthday parties. The Inflatable Basketball Shootout is eye catching and fun to play and does not require any strenuous activity so everyone can play. Now’s the time to challenge your boss! We have had feedback from family backyard parties that it was loved by the youngsters as well as even the older adults who gave it a go. Challenge your friends or relatives for a day of fun and laughs. 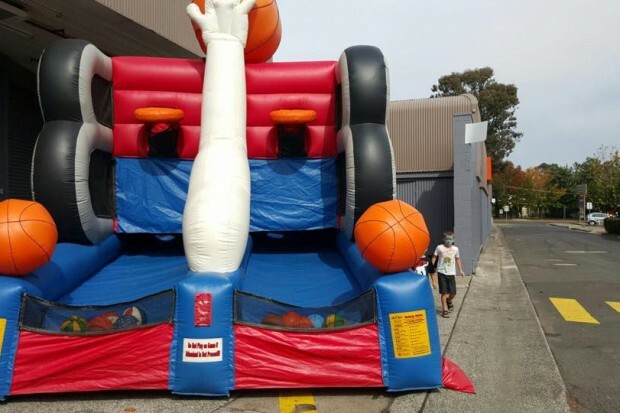 The inflatable basketball shootout is also great as a hook at trade shows and exhibitions. It is tall and striking, so it always attracts a crowd. You’re shooting the ball at your net while your opponent shoots at his net. The twist is this: when you sink a ball it comes out on your opponent’s side and likewise. The object, then, is to rid yourself of all of your basketballs within 30 seconds to win. The player with the most balls on their side loses. It really heats up as you have to shoot consecutive shots of your own basketballs plus the ones that your opponent has sent to your side in order to win. If you wish to play single player action, the game easily converts. Be sure to check out the Beach Volleyball Arena as other interactive games as well! 1m wide with no steps to the set up area.